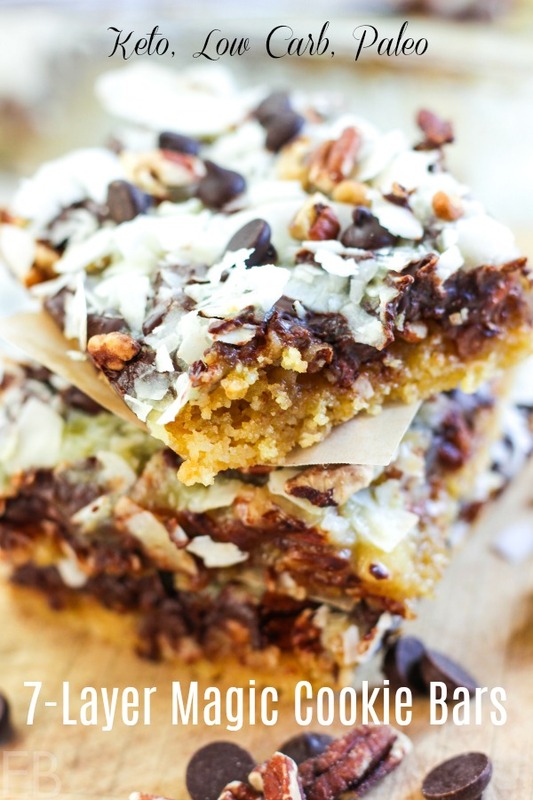 Seven Layer Magic Cookie Bars are magically like you remember them, but a whole lot healthier! With whole foods like Fair Trade chocolate chips, homemade sweetened condensed milk-meets-caramel, and shaved dried coconut, you’ll LOVE the same classic flavors but feel better about them. Also, look forward to a nutty, grain-free shortbread crust! This festive treat can be made Keto, Low Carb or Paleo — All turn out perfectly, and you’ll love bringing them to share for holiday parties or other gatherings. This bar only needs to have five layers, depending on how easy you want the making of them to be. With five layers these bars are already perfect, so don’t feel deceptive 😉 if you call them Seven Layer Bars. 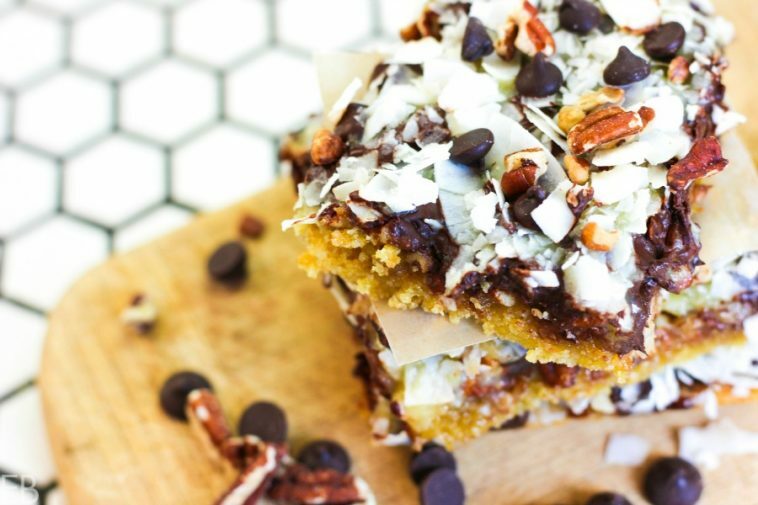 After all, a Seven Layer Bar is a kind of cookie: The theme has a shortbread crust, a caramelly layer of sweetened condensed milk, layers of shaved coconut, pecans or walnuts and chocolate chips! You can also add the customary homemade butterscotch and white chocolate chips. I sometimes omit the final two toppings to make life easier! If you feel it’s important to have seven toppings, make the homemade Keto/Low Carb butterscotch chips here and Paleo butterscotch chips here! They’re lovely! Make homemade white chocolate chips with this Paleo version or this Keto/Low Carb recipe (yum!). Or if you love nuts, you can top your bars with not just pecans or walnuts, but pecans, walnuts AND chopped macadamia nuts — all three of which are healthy! !, delicious and naturally low in carbs — thus making 7 layers. Processed butterscotch chips and white chocolate chips have very unnatural ingredients in them. To date I have not seen Keto, Low-Carb or Paleo white chocolate chips or butterscotch chips being sold. I do love the homemade recipes for these though! Time saver? : Make the white chocolate chips and butterscotch chips another day for general use. Then you’ll have them on hand when it’s time to make this recipe! The standard nut used in Keto, Low Carb and Paleo baking is, of course, almonds. But as you may know, almonds are a major burden on California’s ecosystem, as they’re a crop that requires a lot of water, and Cali is a desert. Also, almonds are high in omega-6s. 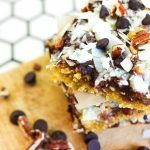 This Seven Layer Magic Cookie Bar recipe is made with walnuts or macadamia nuts instead! Walnuts and macadamias both make a great shortbread crust! I buy mine at Trader Joe’s because their nuts are extra fresh. You can indeed use blanched almond flour in this recipe if you prefer … but consider switching to other nuts to do our fair Cali a favor, and your body! Walnuts are rich in omega-3s and macadamias are loaded with monounsaturated fat (like olive oil!). A quick series of pulses in the food processor yields an easy-to-use nut flour for your baking needs! In addition to considering the flavor of each nut, also consider the color. If you want a paler crust, use macadamia nuts. Walnuts will yield a slightly crispier and darker crust. Want to make your baked goods even healthier and easier to digest? Learn to soak and dehydrate your nuts here, which reduces phytic acid. Although a little known wonderful fact about macadamia nuts is: They’re naturally low in antinutrients like phytic acid. The shortbread crust for these cookie bars is a combination of nuts and coconut flour, to create a flaky, crumbly, tender crumb that’s pie crust-meets-cookie. This nut-coconut flour crust is Keto/Low Carb or Paleo, depending the sweetener you use. Most standard Seven Layer Magic Bars use sweetened condensed milk from a can. I made several batches of these bars to experiment with what we liked better: homemade Low Carb or Paleo sweetened condensed milk OR the same versions of a light homemade caramel. We all agreed: Caramel wins. So my sweetened condensed milk is caramelized for more flavor … and even has a touch of sea salt — delicious! For this reason, be sure to follow the cooking times below. The crust bakes first. The caramel cooks (easy process!) on the stove top while the crust bakes. Then, don’t let the caramel cool and hang out in the pan. As soon as the crust is topped with a couple of the toppings, fresh from the oven, the caramel coats it all — and finally firms up on the crust. I top all with a final smattering of chocolate chips and pecans. Cooking times vary slightly on the condensed milk caramel, depending on what sweetener you use, with a longer cooking time for the low carb sweetener version. You’ll see all that below in the recipe! In large metal bowl combine dry crust ingredients: nut flour, sweetener, coconut flour, collagen, baking soda and sea salt. Mix together well. In a small bowl combine mostly cooled butter, cream, egg yolks and apple cider vinegar. Add liquids to flours. Use hand held mixer or a fork to thoroughly combine ingredients. Spread and press crust ingredients over the bottom of 9" by 13" pan or casserole dish. (It will be sticky like cookie dough.) Wet four fingers of one hand to pat dough into pan and prevent sticking. Bake in preheated oven 15-20 minutes. (Walnut-based crusts burn more easily, so watch closely. If the top of the crust burns a bit, it will not affect the crust's overall outcome.) While it bakes, make the condensed milk. Place cream in heavy bottomed saucepan. Add sweetener. Heat over high heat, stirring the whole time until the sweetener is fully dissolved and cream is steaming hot but not yet simmering. Reduce heat to medium. Do not stir anymore. Keto, Low Carb version with Swerve: Allow cream to fast simmer/slow boil 14 minutes. Paleo version with coconut sugar: Allow cream to fast simmer/slow boil 8 minutes. Remove from heat, and use within 5-10 minutes. Do not make ahead, because it will set up and does not reheat well. Sprinkle 1-1/4 cups pecans over surface of baked crust. Top with 1/2 cup chocolate chips. When sweetened condensed milk has cooled 5-10 minutes max, pour it over the pecans and chocolate chips. Top with shredded coconut and press down lightly on coconut. Top with remaining 2 Tablespoons pecans and 1/2 cup + 2 Tablespoons chocolate chips (placing these chocolate chips on top prevents all of the chocolate chips from melting under the hot caramel). Allow to cool to room temperature, about 2-3 hours. Cut into 24 bars if moderating carbs, or larger pieces if desired, and serve. Find the best grass-fed collagen HERE. Use code BEAUTIFUL10 at checkout for 10% off your entire order. 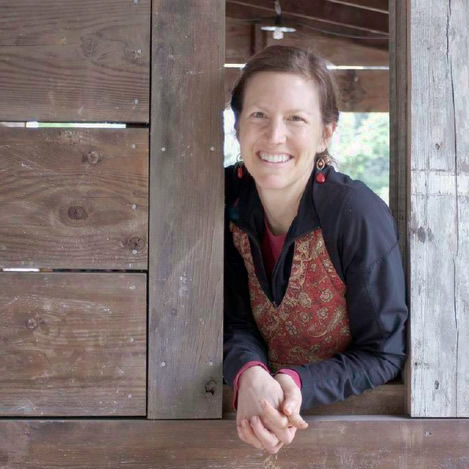 Which Fair Trade chocolate chips to buy? For Keto/Low Carb, use Lily's HERE. For Paleo, I recommened sweetened nibs HERE or homemade chocolate chips HERE (and butterscotch chips, if you want to add those too!). For great standard chocolate chips, I recommend Equal Exchange, HERE. For what event or person will you make these Seven Layer Magic Cookie Bars? Oh gosh this is so special and so fun Megan! I can just see my girls loving making each of these special fun layers! Thank you! oh yum!! what a magical combo to celebrate the season!!! I always used to love Seven Layer Bars, but I wondered why they were called “seven layer” when mine didn’t have that many ingredients! I guess the butterscotch and white chocolate chips are what I was missing. I’m so glad that you’ve developed this healthier version, and I’m definitely pinning it! Yay Cathy, thanks!! It’s funny how it makes you feel kind of guilty to only have five layers lol, but they really don’t need the other two. 😉 Cheers! I’ve never had a 7-layer cookie bar before, these sure seem extra special. I like that you include a macadamia version for those of us who can’t eat walnuts. These look wonderful with all of those lovely flavours and textures. These would be great fun to get kids involved with making the layers. That caramel sauce sounds delicious! I think these might be my last request! Oh my goodness. Those look absolutely amazing! 7 layers! They are the ultimate comfort food! Hi Cindy, I am (this weekend) working on getting the nutritional panel! 🙂 I hope to have it up in the next few days! Feel free to check back. Thank you! Hi Cindy, I just got the nutritional facts added! 🙂 I’ll be going through all my Keto, Low Carb recipes and updating them manually, but this one is done. 🙂 Carbs and calories show above, but NO sugars in this recipe, which is why it doesn’t show up. These look/sound phenomenal. I’m going to see if I can gently persuade my daughter to make them for us this week!